Manufacturer of a wide range of products which include car under body lance, car wash ceiling boom, car under body cleaning services, car washing rotating boom 360/180, water washing machine and car washing equipment. 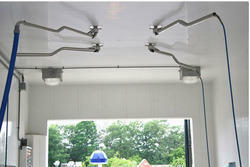 This Car Wash Boom can be used together with any car washer upto 200 bar pressure. With Solid Stainless steel construction for Long life heavy duty operation, this boom is designed to ease the comfort of the operator making it wasy for him to manoeuver the washing hose around the car. 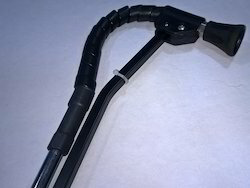 The result is a fatigue free operation that extends the life off all your service equipment. Nissan Clean India is proud to present its latest invoation in under chassis wash system. This Sliding Under Chassis Wash system moves from hood to boot below the car under chassis and effectively cleans the dirtiest and hardest stain with ease through the extreme high pressure of water upto 50 Bar. 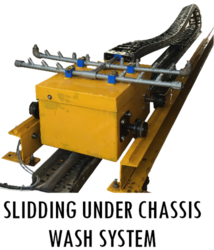 Sliding Under Chassis Wash System is a rectangular box type structure that moves on rail and it comes with a hightech cable track chain that safely preserves the water pipe hose. It useful for removal of grease marks and decontamination of the Car’s under chassis. It is made of zero nozzle directional jets which gives extra high pressure required for effective cleaning of Under Chassis Area. Two rail tracks are provided for the movement of the Robot. Operation of the under chassis wash system is extremely simple. The operator merely locates the vehicle on the wash pad, selects the programme number required and pushes the start key. The whole programme is then carried out automatically with the cleaning trolley moving along the track whilst the unique zero degree spray nozzle sweeps from side to side. The under chassis wash system is proven to be up to 4 times more efficient than manual cleaning methods. Using the under chassis wash system, the user can guarantee consistent cleaning results and due to the cycle being automatic, usage of water, electricity, detergent and oil/gas fuel can be accurately forecast for budgetary purposes. Once a under chassis wash system has been installed, vehicles are cleaned more frequently and service times are reduced, resulting in faults being detected earlier and possibly avoiding major and costly vehicle breakdowns. Installation of the under chassis wash system is quick and simple with the trolley rails bolted direct to the floor, suspended over an existing inspection pit or fitted to a specially constructed ramp. Varying options are available to suit both customer and site requirements. wall boom and ceiling boom made of Stailless steel and heavy grade material this in suitable for any kind of high pressure jet machine and easy to install . water flow:11 to 21 lpm.